Pasta making is an art. Loving pasta is not wrong. Making pasta is not wrong. Making love to pasta is. So with this in mind lets begin with a simple pasta recipe and work our way to more creative variations. Pasta making is a lot easier than you may think. All you need is the time and the right equipment and your ready to go. Once you learn the basic technique, you'll be making lasagna, raviolis and spaghetti before you know it. Hopefully you will be making them often. Unless you want to make the pasta by hand you should invest in a pasta machine. A hand cranked wringer style or an electric one will work just fine. These come with a variety of attachments to make many types and styles of fresh pasta. So, lets start pasta making or making pasta. Whatever, lets just begin. On a clean surface place the flour in a mound. Make a well in the center and add beaten eggs, water and oil. Knead together by hand just like bread dough for about 15 minutes until dough is nice and stiff. Let dough stand covered in plastic wrap for about a half hour. 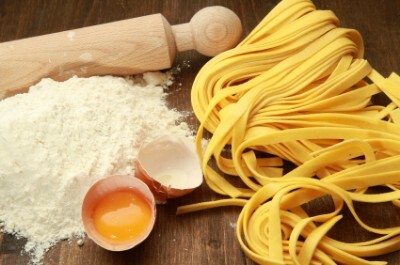 Roll the dough out with a rolling pin as thin as you can or you can roll it through your pasta machine. Cut into the various shapes needed. Place about 8 quarts of water in a large stock pot. Add salt and a little oil in the pot. Bring water to a boil before adding pasta. Cook fresh pasta for about a minute until "al dente". ...and your ready to top with your favorite sauce. Personalize your pasta by adding a little flavor to your dough. Just be careful not to overpower the pasta with flavor that takes away from your sauces or other ingredients. Tomato Pasta can be made by mixing in around 4 tbls of tomato paste with the flour. Herb Pasta can be made by mixing fresh finely chopped basil, sage or parsley into the flour. Lemon Pepper Pasta can easily be made by adding around 3 tbls of grated lemon rind and 1 tsp. of fresh ground black pepper to flour. Black Pepper Pasta is made simply by adding around one tbls. of fresh ground black pepper to the flour. Spinach Pasta can be made by pureeing around 6oz of spinach in a blender then add to flour and mix. There are countless ways of flavoring pasta. Experiment and be creative until you find your perfect personal pasta.